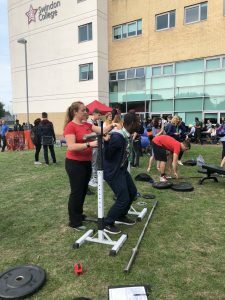 On Monday 3rd September Swindon Barbell took to Swindon College to be part of their Freshers Fair event. Taking equipment from the club Head Coach Charlie Shotton Gale and Referee and Coach Helen Toms along with members Chris Guttridge, Sarah Watkins and Emily Sheppard attended the event as part of Swindon’s drive to introduce young people to positive exercise. 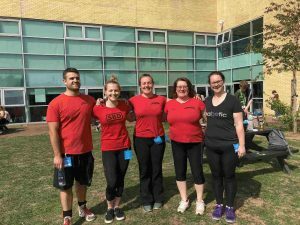 The event itself was one of the busiest School / College events that Swindon Barbell have ever attended, with students trying all three of the Powerlifting disciplines (squat, bench and deadlift). Those of all fitness levels were offered the chance to try something new and many of them were taken with the sport, some asking there and then about coming along to the club to learn more! 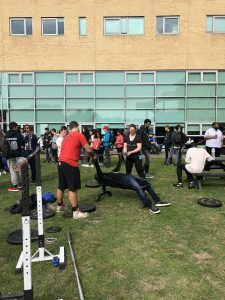 Head coach Charlie spotted several students who looked to have a very promising future in Powerlifting should they continue, and has encouraged them to visit the club and train with us on one of our Novice nights – Tuesday or Thursday with coach Helen – to develop their natural ability. 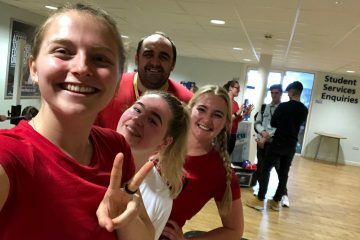 We hope to see them in the gym soon and perhaps even on the competition stage in the future, following in the footsteps of New College student and member Emily, who took to Powerlifting following a very similar event and was competing on the European platform only 18 months later. 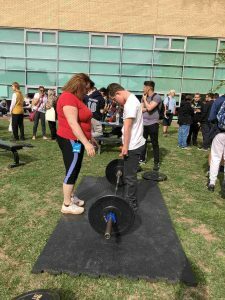 Following the huge success of the event and the interest in Powerlifting from students in all departments of the college Swindon Barbell are now in discussions with Swindon College about bringing a Powerlifting club to them on a more regular basis. As they have a newly built state of the art gym it could be an opportunity for many students who have not yet found their place in sport to build a stronger and healthier future. Next week Swindon Barbell are back out in schools, this time at New College Swindon where they hope to have as much success. 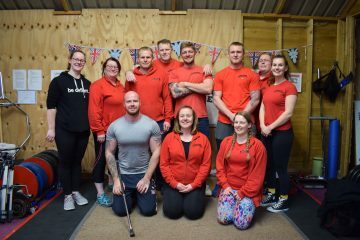 As a club Swindon Barbell is proud to be making a difference to young people in Swindon and Wiltshire by providing quality coaching to help more people become stronger in body and mind.